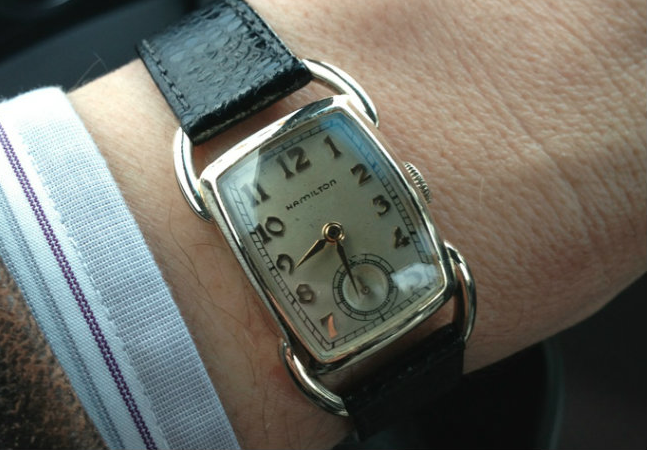 In 1939 Hamilton introduced the Bowman - a very unique looking watch with sweeping tubular lugs. It must not have been very popular though as it was a "one-year wonder" and only made in 1939. The Bowman is very similar to an earlier model called the Bentley. Unlike the solid 14K gold Bentley, the Bowman is 14K gold filled. 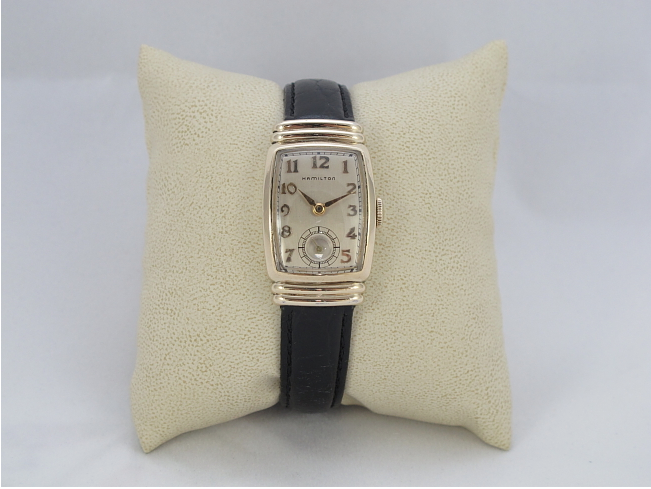 It shares the dial pattern and crystal with the Hamilton Emerson, which was introduced the following year (1940). In fact, it looks a lot like an Emerson except the lugs are totally different. Behind the dial is a 14/0 sized 17 jewel 980 movement. The dial choice was easy... only an applied gold numeral dial was offered. I've had my eye out for a Bowman for some time now. I don't know how rare they are but they are definitely uncommon and you can go a long while without seeing one for sale - especially one in nice shape for a reasonable price. However, as fate would have it, I recently stumbled upon a Bowman with a buy it now option and I jumped on it within an hour of it being listed. Based on the seller's photo I could see it would need a new crystal and the refinished dial was pretty dirty. I happened to already have a crystal on hand from an Emerson I restored a while back and an original dial too that a friend gave me when I restored his Boulton. Bracelets were not original options for the majority of Hamilton watches until the late 1940's - so the metal bracelet on the Bowman had to go. Once received, I serviced the movement, installed the "original" dial and a fitted a new glass crystal. With a new lizard grain strap, this Bowman now looks awesome. And just for reference, here's a photo of an Emerson so you can see how similar they are. The Emerson featured "hidden" lugs so you can't see how the strap attaches. Both watches are fairly small (especially the Emerson) and good choices for a ladies watch, if you're in thinking of a nice gift for a special lady who appreciates fine vintage time pieces. Great and attractive style of watch/.